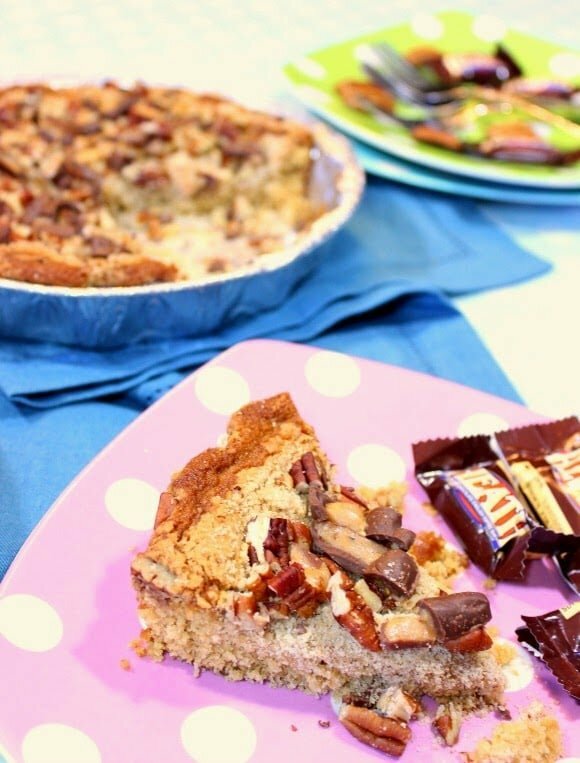 If you love toffee and chocolate, you’re going to love Mom’s Retro Heath Bar Cake!! Hi Everybody! Welcome to #SundaySupper’s Retro-Recipes theme for the day. 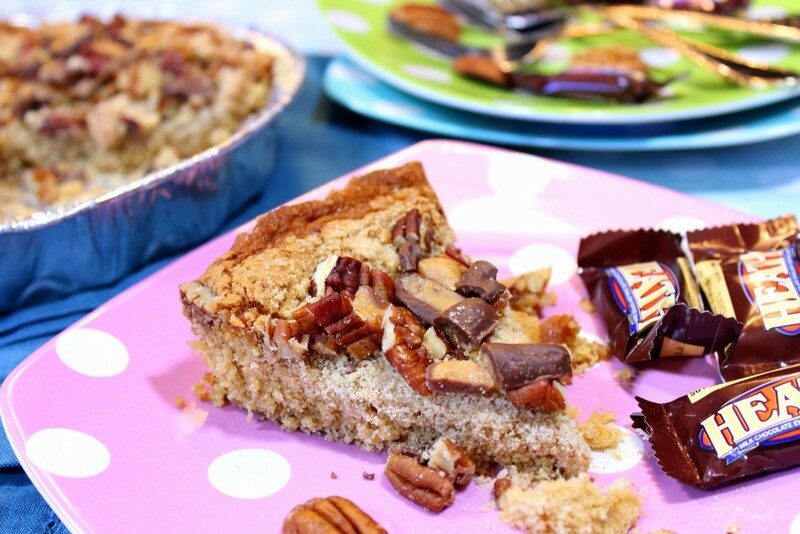 This Heath Bar Cake is a recipe that my mom used to make when I was growing up. It is seriously one of my favorite dessert memories from my childhood. Surprisingly this is the first time I’ve ever made it. Hmmm. Wonder what the heck I was waiting for? When I was growing up, my mom used to get gently kidded that the only time she ever baked was when company was coming over. Even though it was said in jest, it was pretty much a true story. LOL. Sorry mom. My mom used to get kidded about her frozen desserts too. She was the one in the family with the sweet tooth (and still is to this day). Every night after we finished off our family dinner (5:30 p.m. – no exceptions), mom would pull out some type of frozen Sara Lee dessert and cut off a frozen hunk or two for herself and whoever wanted a dessert that particular night. It was rare that I ever partook in those frozen confections, as I was always the one who reached for whatever was left in the bottom of the vegetable bowl. Weird kid, I know. 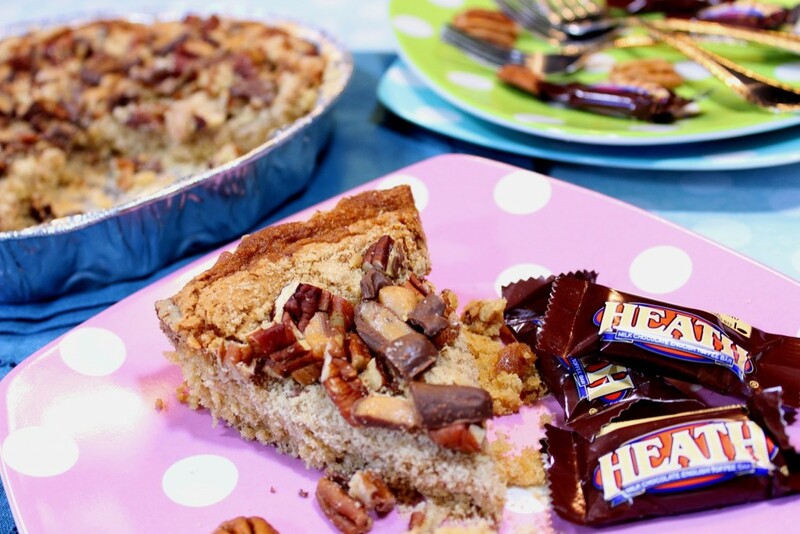 Unless of course, mom was serving her Heath Bar Cake. Mom got this recipe for Heath Bar Cake from her aunt Regina sometime in the early ’60s when Heath toffee candy bars were in their hay day. These days large Heath bars may be hard to come by, but the smaller snack-sized ones should be easily found on grocery store shelves. This recipe from mom’s Aunt Regina was written to be baked in a 9×13 pan, but my mom would always divide the recipe and bake two cakes in round disposable 8″ aluminum pans. I chose to bake my cakes just the same way mom did for that blast-from-the-past feel and to aid in today’s #SundaySupper retro-recipes theme. -In a large bowl with a hand mixer or the bowl of stand mixer, beat the butter and brown sugar until incorporated. Slowly blend in the flour to form a crumb-like texture. Reserve 1 cup of the crumb mixture and set aside. -Add the baking powder, baking soda, salt, egg, milk, and vanilla to the large bowl and beat until well blended. Spray the pan/pans with baking spray. If using the two round pans, divide the dough evenly between the two pans. If using a 9×13, pour the batter evenly into the prepared pan. -Sprinkle the reserved crumble topping evenly over the cake batter. 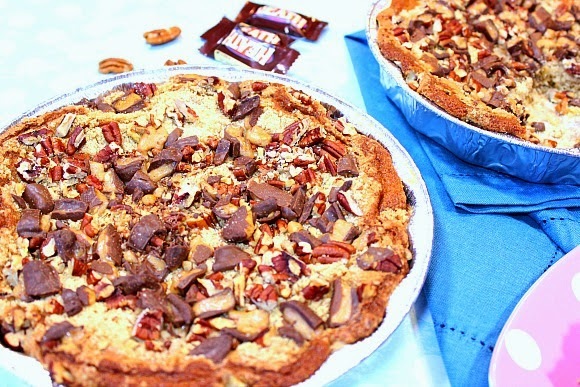 Divide the Heath bars and pecans (if using 2 round pans), and sprinkle them evenly over the crumble topping. -Bake in a preheated oven for 30-35 minutes or until a toothpick inserted in the center comes out clean. Cool completely before serving. 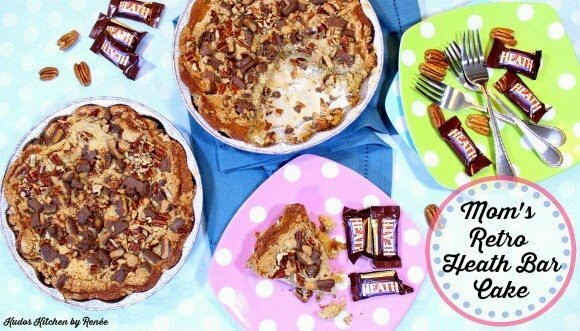 I’m so glad I finally asked my mom for this recipe and I can’t wait to serve this Heath Bar Cake to friends and family. Of course, I’ll have to take one out of the freezer to thaw, first! HaHa! Love you, Mom!!! What?! A kid who liked vegetables more than dessert! Say it isn't so 😉 I was a heath bar lover…until skor came around. I still love those heath bits though and use them in my baking every so often! My sisters and I would inhale the rare Sara Lee desserts in our freezer!!! 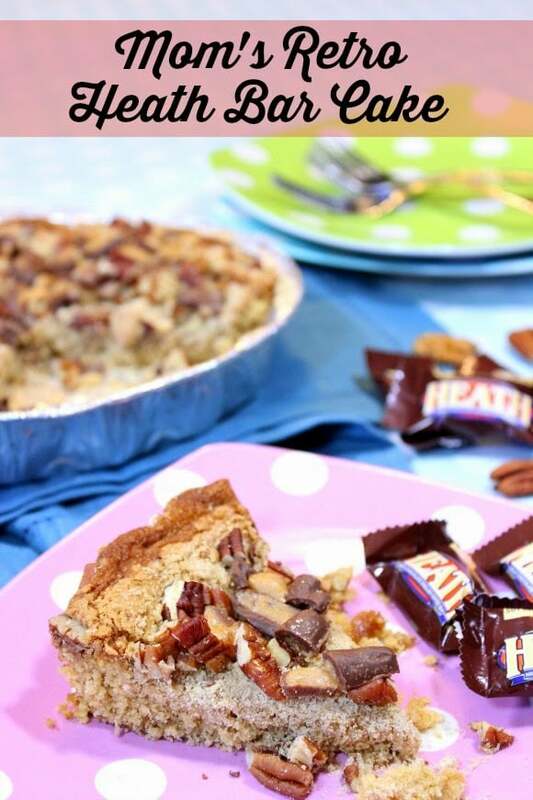 Just as we would this fabulous Heath Bar cake!! My mom's heath bar dessert was a frozen pie, with brown edge vanilla wafers as the crust, ice cream in the center and heath bar crumbs on top. Doubt you can get those wafers today but it was awesome. Now this is one cake I could devour! I wish I grew up eating this! I have never seen anything like this! Wow. I might just have to try this recipe. I don't have much of a sweet tooth, but I do love toffee and chocolate. This is one out of control and delicious cake! Wow, this looks amazing! So rich and delicious! Oh my gosh, I am so saving this recipe to make! It sounds amazing! My Mom was a holiday baker too! Dessert at our house was usually ice cream. I've got to have this! I'm getting the ingredients this week! Heath is my fav! Great recipe! 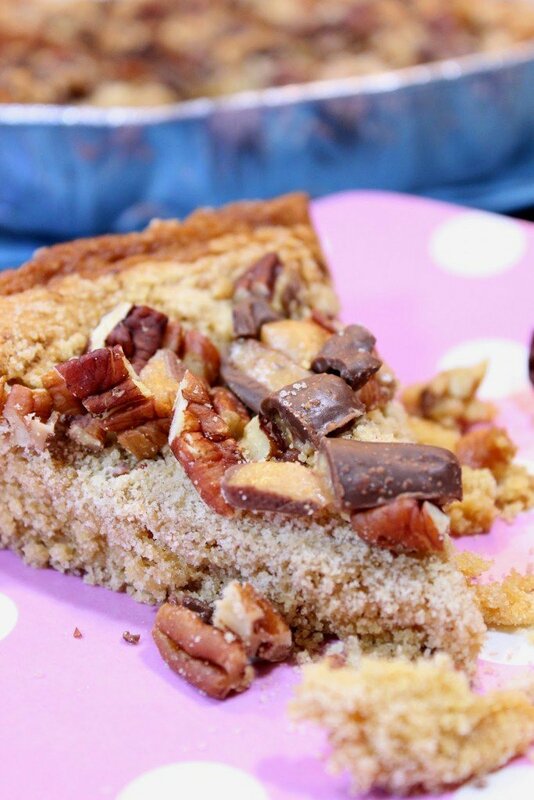 OohhhEmmmmGeeee I love heath bars so I know this cake would be gone in a heartbeat at my house!! If my mom would have made this cake when I was growing up it would have been a favorite of mine too. I love all things toffee and Heath Bar. I so need a giant piece of this cake! I love anything with Heath bars, such a vice!